After the first few months of playing, saxophonists are almost always excited to discover the differences a step-up saxophone can make. Not only do step-up saxes produce a fuller richer sound, but they respond quicker, and often extend the range of the saxophonist. Passages that were difficult on the beginner saxophone not only become easier but sound better and are more fun to play. Saxophones are typically classified in four levels: beginner, intermediate, performer, and top-line. The differences between the models include better intonation and added key mechanisms that make the instrument easier to play and extend its range (high F# and G for alto saxes, low A for baritones). 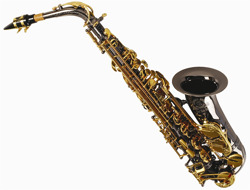 Some step-up saxes are made of better materials, such as annealed brass. Ribbed construction gives the mechanisms more stability and allows the instrument to retain fine adjustments better. Blued steel springs make the keys respond more quickly without requiring the saxophonist to apply more pressure. An adjustable thumb rest allows the player to find the most comfortable position to hold the sax. More attention to key adjustment and tone hole covering in final assembly help give it a quick and true response. A detachable bell makes the instrument easier for technicians to keep in top playing condition. And cosmetic improvements including brass keys, extra engraving, and mother-of-pearl finger buttons make it more visually appealing. While all saxophonists would enjoy and benefit from the best saxophone, an intermediate saxophone is usually adequate for an average musician to play in band through junior high and high school. For students who are more serious about their music or are likely to play in college, a performer-level saxophone is a good choice. College music majors, professionals, and those who consider saxophone a serious avocation often choose top-line saxophones.